The sun rises behind the Christ the Redeemer statue, above the Guanabara bay in Rio de Janeiro, Brazil, July 19, 2016. Zimbabwe says all its qualified athletes for the Rio Olympics will participate, after it convinced them using the Centers for Disease Control and Prevention’s Olympics Zika risk assessment report. Dr. Austin Jeans, who heads the Zimbabwe medical team to the Rio Olympics, said some athletes from the southern African nation had raised concerns over the Zika virus, which has led to a number of athletes worldwide withdrawing from the games. Zimbabwe is sending its biggest number of athletes ever to an Olympics, led by a woman's soccer team that has qualified for the first time. Some members of the soccer team had threatened to quit over lack of information about the Zika virus. But Jeans, a sports medicine expert and the “Zimbabwe Team Rio 2016” compiled what he termed the Information Bulletin – Zika Virus Outbreak. 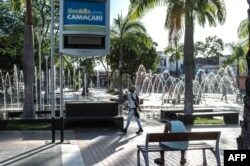 FILE - The main square of Camacari, Bahia, Brazil, where the first case of infection by Zika virus was detected, on January 29, 2016, Brazil. "So, from the Zimbabwe Team we are pretty sure that we have this under control. And should we be successful in the awareness and implementation of these measures, I do not believe that the risk is significant at all," Jeans said. "And perhaps, I will make you aware that the U.S. Centers for Disease Control and Prevention, which is a worldwide health advisory and research body, published a report on 13th of July which only puts four countries at the risk of Zika transmission back to their countries and we are not one of those." That is a reference to Chad, Djibouti, Eritrea and Yemen, which according to the CDC report, have the highest risk of importing the virus that is carried by a particular type of mosquito. Jeans said the CDC finding had been explained to Zimbabwean athletes, adding that it is winter in Brazil, which makes the mosquito population smaller. 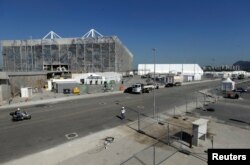 The aquatic venue is pictured at the 2016 Rio Olympic Park in Rio de Janeiro, Brazil, June 15, 2016. Picture taken on June 15, 2016. The woman's soccer team had threatened to quit over lack of information about the Zika virus. Wednesday, one member of the Zimbabwe women’s team told VOA the information from the CDC had calmed the athletes and they would now go to the Rio Games. Golfers Rory McIlroy, Jason Day and Adam Scott are some of the athletes that have pulled out of the Rio Games, citing fears of contracting the Zika virus.